Many members of the entertainment and music communities have reached out to support Demi Lovato as she struggles with a recent drug overdose in the last few days. With so many fellow artists and entertainers sending their love, Kelly Rowland appears to have taken her Demi love a step further. Some may only have the means to send their well wishes on social media but the Destiny's Child singer proved her friendship with the former Disney star by inking one of Demi's most recognizable tattoos on her hand. Recreating the massive lion tatted on the "Heart Attack" artist's hand, Rowland decided to show love to the star with a temporary version on her own body. 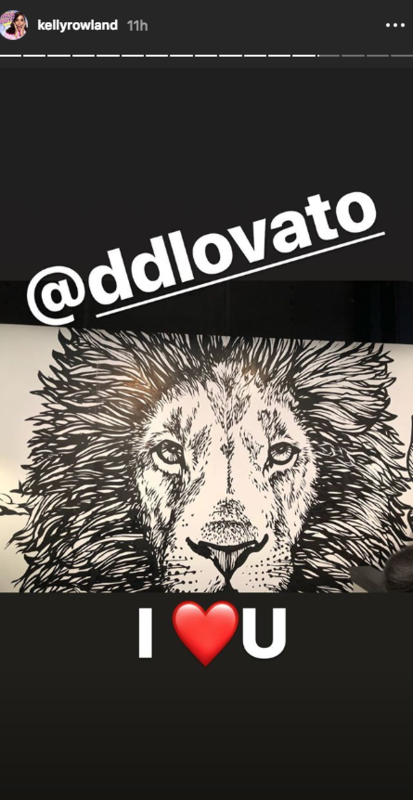 Taking to her Instagram story, Kelly noted that Demi was on her mind, getting the lion piece sketched out and placed on her own hand. A touching display of love and support, Rowland and Lovato have been friends since their work together on the X Factor. Remaining close since filming, Kelly clearly has a lot of love for Lovato, proving that her heart weighs heavy after a scary hospitalization earlier in the week. Kelly's act is the latest in a string of celebrities wishing well for the troubled star. Drug addiction is a difficult disease to overcome but Demi has proven to be capable of pulling through in the past. We're praying for her to get well soon.